Surgical instrument sterilization tape is used to seal sterilization packs or wraps. The tape will visually indicate that the pack has been exposed to the steam sterilization cycle by its distinctive, non-reversible color change from beige to black. Lead-free ink means no hazardous waste issues. The tape material has a stretchable backing that minimizes tape "pop-off" during sterilization. 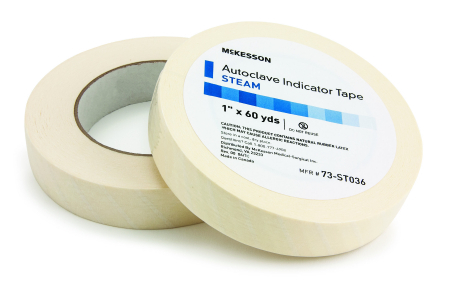 This tape can also be written on or labeled with pre-printed labels. Sold individually. 3M Comply lead-free steam indicator tape measures 0.94 inch x 60 yards. Medline steam indicator tape measures 1 inch x 60 yards. Contains latex. 3M Comply lead-free steam indicator tape measures 0.70 inch x 60 yards. 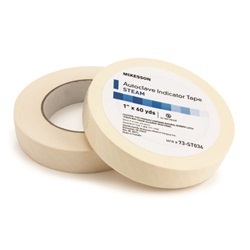 Mckesson steam indicator tape measures 1 inch x 60 yards. Contains latex.